A Photographic Study of the Artistic Interpretation of Philosophical Statements by Popular Artists: What Is Meaning? An Interactive Study Of Human Response To Mediated Actions Without Consequence: Naughty Or Nice? This piece was created as a variation of the full-sized “Naughty Or Nice?” piece for a specific installation context. The Edible Art fundraising event requested a Harvey Loves Harvey piece, and we decided to re-make “Naughty Or Nice?” using food (to fit the theme of the event). Thus, like “Naughty Or Nice?”, “Eat Or Be Eaten?” presents our audience with the opportunity to make Matt and Jason interact in nice, neutral or mean ways. The difference, though, is that this piece uses food as the medium of violence. 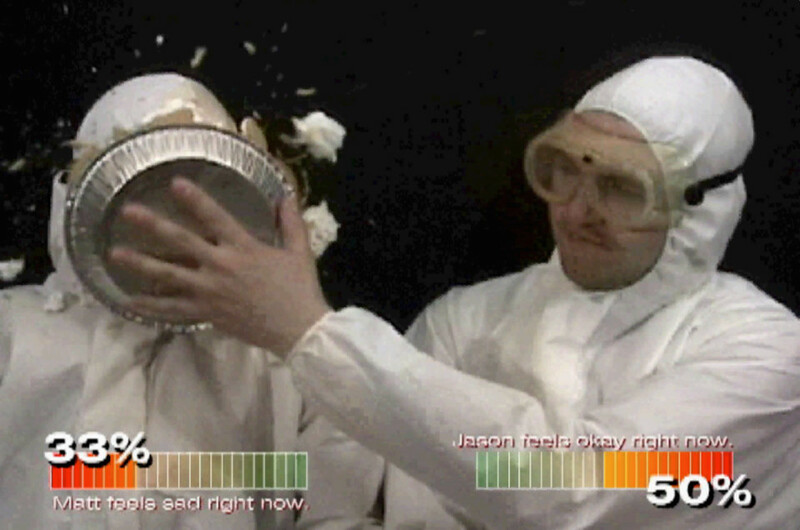 Bad actions include a pie to the face, ketchup and mustard poured over each other, or being slapped with raw meat. Nice and neutral actions including opening packages of food, sharing, or offering a drink.